The Detroit Red Wings needed to win last night or risk falling into the dreaded 3-0 hole, of which only four teams in the league’s history have ever recovered from. Fortunately, they did just that on Sunday. Through the first two games, the Tampa Bay Lightning’s top line of Alex Killorn (LW), Tyler Johnson (C), and Nikita Kucherov (RW) had already combined for 15 points before Game 3 began, with Johnson leading the way with two goals and four assists. Jimmy Howard had struggled through the pair of games as well, allowing seven goals on 57 shots (.891 save-percentage). Goalies were switched and lines were shuffled for Game 3 at Joe Louis Arena. Petr Mrazek received the call from coach Jeff Blashill in an effort to spark the team. Mrazek had not had success in the regular season against the Atlantic Division rival. He allowed three goals in a loss on February 3rd, then allowed three in a 6-2 loss on March 22nd. Veteran forwards Pavel Datsyuk and Henrik Zetterberg were split up and the lines were changed dramatically. Zetterberg centered Gustav Nyquist and Dylan Larkin while Datsyuk centered Darren Helm and Brad Richards (left and right wings respectively) on the second line. The third line now consisted of Andreas Athanasiou, Joakim Andersson and Tomas Tatar, and Luke Glendening centered Justin Abdelkader and Riley Sheahan. Those line combinations were successful. The Glendening line shut down the Johnson line completely. Tyler Johnson did not register so much as a shot on goal (he attempted one but was blocked). Neither did Nikita Kucherov (two attempted and blocked). Killorn had neither a shot nor an attempted shot on net. On the night, Tampa Bay attempted 36 shots (16 hit the net). Detroit, on the other hand, attempted 63, of which 30 found Ben Bishop. Only four Red Wings failed to register a shot, indicating the level of team effort. The Red Wings had a plethora of power plays, as the Lightning were called for a total of 40 penalty minutes on the night, leading to a total of seven man-advantages for the home team. This included a 5-on-3 for a full minute. Only six of the team’s 30 shots were accumulated on the power play. Only one shot occurred during the 5-on-3. All were unsuccessful. 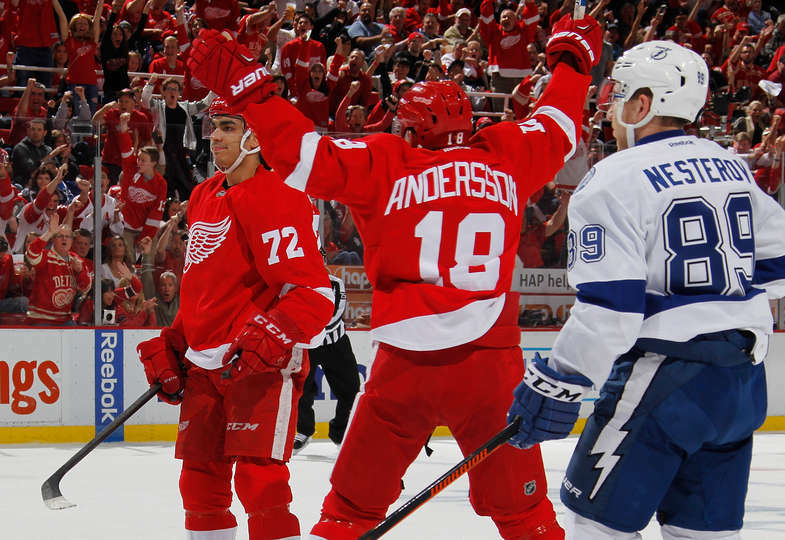 Andreas Athanasiou, the rookie with blazing-fast speed and skill has not played much in his time with Detroit. However, his undeniable talent is becoming too hard to ignore, and his time-on-ice is beginning to slowly increase. He has proven his ability to make an impact on any situation he is put in, and coach Blashill is taking notice. In the first period, just 20 seconds following a Riley Sheahan breakaway opportunity, he received a prime scoring chance as well. Tatar chipped the puck ahead to Athanasiou, who was then defended only by Jason Garrison. AA deked him onto his knees with two spin-o-rama maneuvers. The first spin was counter-clockwise and Garrison fell, allowing him to spin back and attempt a shot which went wide. It was a great individual effort. With 7:18 remaining in the second period, he was able to wheel around and one-time a great set-up pass from Joakim Andersson past Bishop for the first goal of the game and the first post-season goal of his career (in just his third game). It was a booming blast from the top of the faceoff circle on Bishop’s blocker side. Nearly five minutes after Athanasiou’s goal, Henrik Zetterberg had the puck deflect into the net off his skate, a goal that would be announced three times. It was originally deemed to be a legal goal by the officials. The league in Toronto reviewed the goal to make sure it was not a kicking motion. Zetterberg actually had attempted to the push the puck with his stick. When he was unable to bat the puck with his stick, his forward momentum carried the puck in with his skate. The league’s review confirmed the call on the ice, which of course meant a coach’s challenge would follow. Tampa coach Jon Cooper believed that Zetterberg had interfered with Bishop on the play, which was not the case. Once again, the goal was confirmed, the game could continue, and the Lightning forfeited their timeout. Kyle Quincey was scratched Sunday in favor of Brendan Smith. For those wondering how soon it took for Smith to make an impact, look no further than the game’s first two minutes, in which he sent Tampa forward Cedric Paquette flying into the boards. Throughout the contest, he would draw three penalty calls. The last of those three came late in the third period, when he successfully aggravated defenseman Brayden Coburn into taking an interference call which put the Red Wings on the power play with 2:17 to play, effectively closing out the win. With just seconds left on the game clock, 6-foot-7 forward Brian Boyle tried to instigate a fight with Detroit’s Abdelkader, of which the latter would not oblige. While being held by Boyle, Abdelkader asked the referee if he could fight even if his hand was taped (from Friday’s Game 2). Further discipline could result if Boyle was cut as a result (misconduct) so he did not engage. Following the fight that never was, Boyle skated off the ice, all the while making a chicken gesture, flapping his arms as he made his way to the locker room. This will no doubt cause more melee in Tuesday’s Game 4. With three seconds left, Coburn took a run at captain Henrik Zetterberg along the Tampa bench. Riley Sheahan stepped him to defend him. Then Tampa defenseman Victor Hedman stepped in to pull Sheahan off. When Smith noticed two Bolts players on Sheahan, he stepped in and, upon discarding his stick and gloves began shoving Hedman into the bench. What does Detroit need to do to win Game 4? The power play needs to be effective and the defensive accountability of Game 3 needs to carry over. If Tampa’s top line is shut down each game, the series is Detroit’s to lose. Lightning coach Jon Cooper will change his strategy for Tuesday, making sure his team does not spend the majority of the game’s minutes shorthanded. He will also try to work around Detroit’s shutdown line to restart the offense of the Johnson line. Games 6 and 7 would be Sunday and Tuesday, April 26.